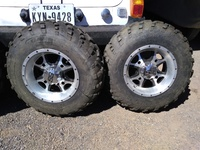 For Sale Full set of UTV 4x4 tires and wheels. 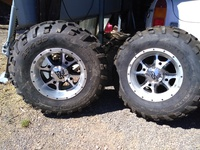 Came off a Polaris ranger 4x4 Tire Size (2) @ 25x10x12 and (2) @ 25x8x12 Rims are 4 bolt 4" x 156mm Bolt Pattern May fit other UTV with this bolt pattern. Like new condition.. $ 275.00 obo. all four Call 432 249 0005 or 432 426 3947 Located in Fort Davis.